The Possessive case (or as it's also known, Genitive case), is that form in which a noun is used in order to indicate that something belongs to the person or thing for which it stands. In the sentence “I borrowed Gretchen’s piano,” the noun Gretchen’s is in the possessive case, to indicate that Gretchen possesses something (namely, a piano). Therefore, Gretchen’s, is the possessive case of the noun Gretchen. The noun in the possessive case is said to be governed by the noun which stands for the property which is possessed. In the example above, the noun Gretchen’s is governed by the noun piano. As what is possessed must be a person or a thing of some kind, a noun in the possessive case can only be governed by a noun. The meaning of the possessive case is sometimes expressed by means of the preposition of, with the objective case after it. 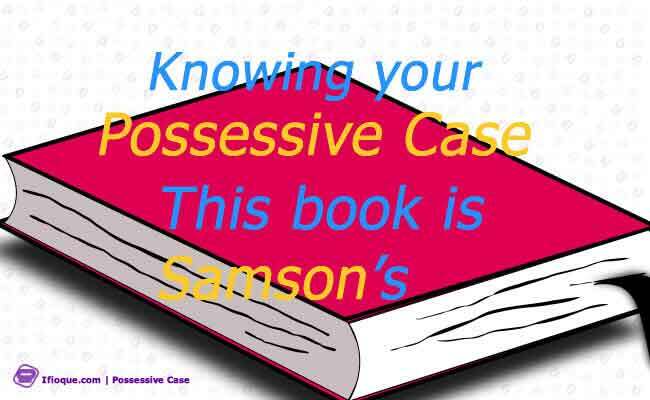 For example, for “Gretchen’s book,” we may say, “The book of Gretchen.” However, the possessive case must not be substituted for the preposition of, unless possession is implied by it. How to form the Possessives. The following articles concern the basic guidelines for forming the possessive case in English. one’s home, by day’s end, John’s pet, the witness’s testimony, a fox’s habitat, the knife’s edge, etc. the doctors’ recommendations, the glasses’ rims, the flies’ buzzing noises, boys’ school, girls’ squad, horses’ tails, etc. However, when the noun is in plural, but does not end in –s the possessive is formed by adding ’s as in: men’s club, children’s books, etc. the McCarthys’ and the Williamses’ parties, the Schwartzes’ trip. Jesus’ teachings, Moses’ children, Achilles’ heel, Hercules’ strength, Ramses’ reign, Xerxes’ conquest. In certain cases, whereby two or more people or things jointly possess something, the conventional practice is to add the –’s or apostrophe to the last element only, as in: Gift and Vick’s savings. But when two or more people or things possess something separately, we usually add the –’s or apostrophe to each element, as in: the Smiths’ and the Joneses’ houses are for sale.